Do you need a speechwriter? Good speeches start with good listening. At the start of each assignment, I listen not only for what you want to convey, but for what motivates your audience, the tone of your voice, and your personal style. As an author of eight novels who has stood behind the podium many times, you’ll find I’m adept at capturing your voice and message. Nuance Communications – Sales and customer speeches for two top executives of this software company. BTU Ventures – Speeches for the CEO of this international power company, including the keynote speech at the US-Arab Economic Forum in Washington, D.C.
Want to read one of my own speeches? I’ve been an active rider/contributor to the Pan Mass Challenge/Jimmy Fund. Here’s my keynote speech for the PMC check presentation to the Dana-Farber Cancer Institute. 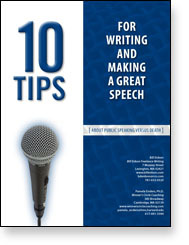 “10 Tips for Writing and Making a Great Speech” – I developed these tips along with Dr. Pamela Enders, a licensed psychologist and performance coach on the faculty of Harvard Medical School.